The bear cams at Brooks Camp, first installed by Explore.org in 2012, have a massive and dedicated online following. Holly, a favorite among cam viewers, with her cubs - one biological, one adopted. Last year 16 million viewers glued their eyes to screens to watch a reality show with no dialogue, no celebrities, and hardly any humans. 16 million – that’s more viewers than the Bachelor, American Idol, or Dancing with the Stars. 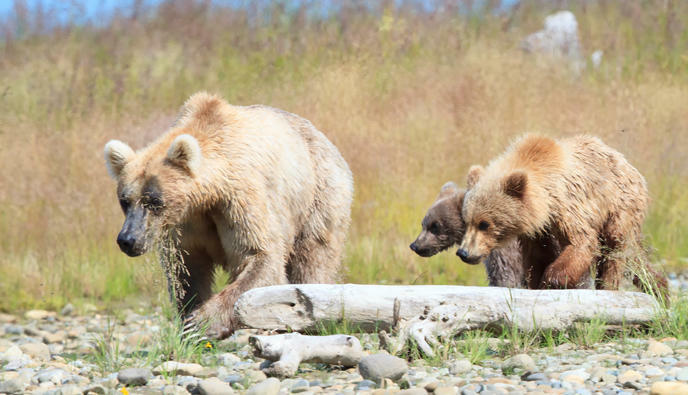 They tuned in to watch Explore.org’s bear cams at Katmai National Park and Preserve, where brown bears catch salmon and hang out at Brooks Falls. The cams went live for their fourth summer yesterday. KDLG’s Hannah Colton has this story about the millions on the other side of the screen. In the days before the cam went live this season, the comment section on the website felt like the long bus ride to summer camp. Returners were catching up with old friends, swapping stories from last year, getting excited and impatient. They were ready to see some bears. That’s 68-year-old artist and writer Dicky Neely. Bruin-inspired artwork by Dicky Neely. I found Neely because he’d posted some of his artwork on the website -- a drawing of a big goofy bear with its nose up against a camera. Neely first found his way to Explore.org last year, looking for surfing videos. "I’m an old surfer, but I’m disabled now and I can’t surf anymore, so I’m home a lot. So I was looking for surf cams and I stumbled on the bear cam. So I clicked on it. And the first thing I saw was a mother bear swimming down the river, with another dark shape on its back… They finally got to shore and the little cub was jumping around and looked so happy to be alive and to be a little bear… it made such an impression on me!" "How how often do you watch the cams?" "Well, every day, sometimes for hours. Of course sometimes I just leave it on and do other things." "Well I was struck by how many people were on the comment section just kinda hanging out and talking with each other... it's like this community?" "Yeah, it is, it’s social thing – I don’t get into that as much, I don't like to just have conversations online... Although, whenever I post artwork, or I do post a comment occasionally, people respond and I usually write back. But, I’ve made friends with some people that watch it. There’s a fellow in Germany, he’s become famous I guess as the bear watcher, named Juergen, and I sent him some of my artwork." "No, I had no idea! 16 million, that’s really something…"
I went to an expert to find out how all these remote viewers are affecting the day-to-day at Brooks Camp. 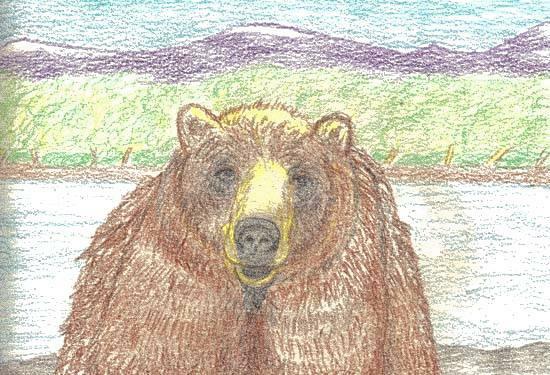 "My name is Roy Wood, I’m the Chief of Interpretation at Katmai Park and Preserve." "-- with just a few exceptions… I think like Yemen had no visitors, and Syria had no visitors and that’s not really surprising. But last year the major surprise was that India moved way way up the list. India is now the third largest viewer of the bear cams, and Pakistan is the 5th largest viewer. And this was really surprising to us because we don’t see very many people from those two countries in person or on the webcam chat boards." Nor does he see many visitors from the Vatican City. But he says, 45 people are watching from there, too. "My sincere hope is that the Pope is watching the bear cams along with the rest of the world." So what is it about these bear cams that is so universally appealing? "Well one thing that was somewhat surprising was how readily people would grasp the idea that bears are individuals." There might be 50-70 bears each season at Brooks Camp. There’s so many, Wood says it can be hard for people on the ground to tell one bear from another. Wood says it’s exciting to have all these extra sets of eyes on the bears. It means when something unusual or interesting happens, they’re less likely to miss it. "So that’s been really cool that they’ve been jumping in as citizen scientists and really helping us learn more and document more about the bears here." To Wood, this is a great success of the bear cam videos. "There aren’t many people who are moved to action from just watching TV. But the cams ARE moving people to action, and we’re very proud of that." Back in Corpus Christi, Dicky Neely says spending so much time watching the cams has changed the way he views bears. Maybe the big difference between bear cam fans and fans of mainstream TV. Unlike fans of Survivor or the Bachelor, the bear cam people aren’t waiting for a catfight, or for someone to make a fool of themselves. They just want to see bears doing what bears do. According to Ranger Roy, the bear cams are here to stay. And as long as the bears are in Katmai, there will be bear cam people around the world rooting for them. Watch the bears yourself on Explore.org.